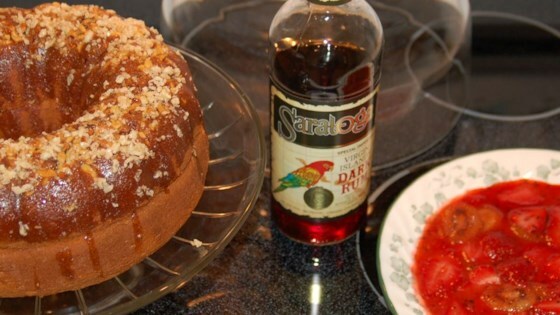 "A moist nutty cake with the deep flavor of dark rum." Preheat oven to 325 degrees F (165 degrees C). Grease and flour one 10 inch tube or Bundt pan. Sprinkle walnuts over the bottom of the pan. Mix together the yellow cake mix, 1/2 cup dark rum, eggs, 1/2 cup cold water, cooking oil and instant vanilla pudding. Pour batter over nuts. Bake at 325 degrees F (165 degrees C) for 1 hour. Cool, invert on a serving plate and prick the top. To Make Glaze: Melt the butter in a saucepan. Stir in 1/8 cup water and sugar. Boil for 5 minutes, stirring constantly. Remove mixture from heat and stir in rum. Drizzle and smooth glaze evenly over the top and sides of cake. Enjoy! I have made this cake a number of times now and it still a crowd favorite. I personally like to use more rum (typically a cup). The response from that is mixed, but the cake is always gone :). This is the best rum cake I have ever had. I have been making it for Christmas for the last 5 years.